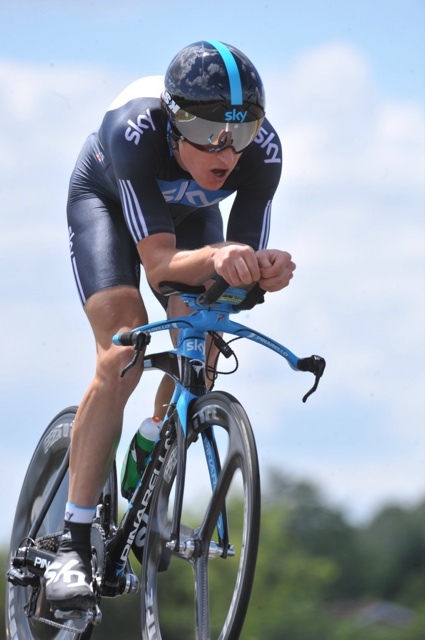 Britons Bradley Wiggins and Geraint Thomas finished ninth and tenth respectively in the final Tour de France time trial between Bordeaux and Pauillac today. Saving a sprint from Edvald Boasson Hagen on the Champs Élysées tomorrow, the flat 52km stage was the final chance for Team Sky to get a win in their debut Tour. Thomas’s result was another above expectation performance while Wiggins had been hoping for better after easing off on Thursday’s stage to the summit of the Col du Tourmalet with today in mind. Unfortunately Sky’s team leader was was defeated by a flying Cancellara and a rising head wind. His ride was arguably better than the results show as he was the only late starter to infiltrate the top ten stage placings as some surprise names from low down on GC rode themselves in to contention. Wiggins had been third fastest at the first checkpoint, 31 seconds behind Tony Martin and 22 behind Cancellara, but from then on he faded away as the wind started to blow. Starting four hours behind Martin (second on the stage) and three-and-a-half behind Cancellara, he never stood a chance. Contador, who won the final time trial around the shores of lake Annecy last year, finished down in 35th position, five minutes and 43 seconds down on Cancellara, further demonstrating the difference in conditions over the course of the day where riders’ start times were spread over a five-and-a-half hour period. Wiggins ride, although strong, wasn’t quite enough to overhaul a Lance Armstrong. The pair battled for third place on the slopes of Mont Ventoux last year, this year they battled for 23rd spot. Armstrong finished a very lowly 67th – 7-05 mins down on Cancellara – in the TT but managed to hold Wiggins off by just 4 seconds. Geraint Thomas finished his Tour de France as he started, with a strong performance against the clock. Starting midway down the field – at 1:29pm – the 24-year-old came in tenth, and third on the stage in the young rider competition that he lead in the race’s first week. With just the stage to Paris to go, Thomas now sits in 67th overall. In his first Tour de France in 2007 he finished 140th.